You are here: Home / Advice and help / How do you protect your map? 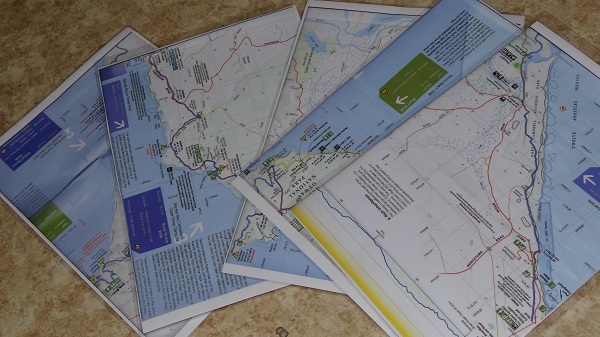 One common problem, if you are using a map on a long trip, is keeping it in good condition. Constant opening, folding, stowing and reopening all inevitably damage the map. Then there is the rain, wind and other conditions that can destroy it in minutes. After a couple of days, the map ends up in four or five pieces, damaged and degraded. About 8 Overland Track trips ago, to save pack weight, we scanned and colour printed the maps for each day from John Chapman’s Overland Track book. Sue then laminated them and they have lasted very well for every trip. In fact, they are still in great condition. This week Frank heads off on the first of 14 trips planned for the Great Ocean Walk between October and May. One map will not survive that many trips, so laminating sections of it is the best solution. 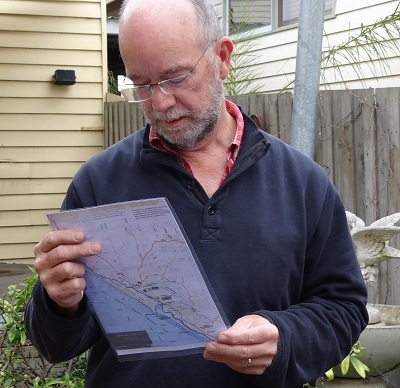 The Great Ocean Walk Map produced by Parks Victoria is a ripper. Set at 1:25,000 it is incredibly detailed and contains many notes, pieces of information, highlights and advice. This is great stuff but not all relevant if you just want to use the map, well as a map! It is a handy thing to take en route to show clients where they are, judge relative distances and where pick up and drop off points are located. You do need access to a scanner and colour printer. We upgraded recently to a very simple HP unit. Look at the whole map and, using a piece of blank A4 paper, work out the areas on the map that will be scanned on each pass. 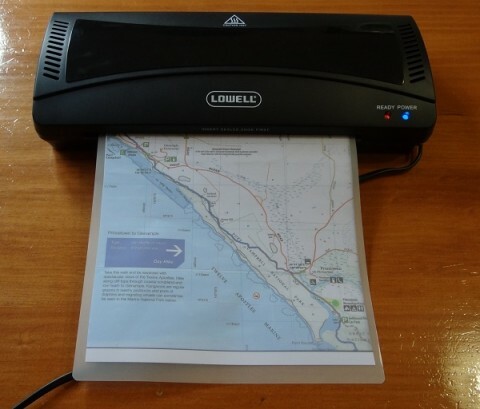 Carefully fold the map so the relevant section is about A4 size and scan it. We used a higher resolution (dpi) than normal to get a good copy. Print out the m,aps. We used colour but black and while works just as well. You now need a Laminator. We picked up one at Officeworks but they are commonly available at stationers or Aldi, for example. The process is quite simple, Sue is the expert here. Just feed it through the machine. We did trim a few millimetres off one side and the end so there was a wider seal than normal. Hopefully this will increase the durability and reduce the potential for delaminating. We laminated the sheets “back to back” , 2 map sections per page. This resulted in 5 sheets for the whole walk. Because these trips are based off track and use shuttles to different points on the GOW each day, Frank only needs to take the relevant section of map for that day’s walking. The original map will be used for briefings and only really opened once a day. What do you do with your maps? Take the original, take a photocopy? Have you tried laminating sections? How did it work out for you? Travelling in a minibus which contained a dozen maps freshly coated in a waterproofing substance left us all nauseous and high. Set against that background, shelling out for a scanner and laminater, on top of the maps’ cost, doesn’t seem unreasonable. But how much do the back-to-back results weigh? Usually, all I do is fold up my maps and put them in an inverted freezer bag. I can then walk with my thumb on the last known location and quickly refer to the map whenever the navigation gets intricate. I have found something similar to laminating. I have for years used talc/contact to cover the front and the back of the maps. You can then still fold then easily and they are not as rigid as using laminate. To save on space, you may only want to cover one side of the map as this is usually what I do. It can be a bit of a pain to get the talc/contact on and it is best done with two people but if you get rid of all the air bubbles the finished product is great. Too much hassle really, unless of course you’re a guide who frequently walks the same area I just take the map as it is. When it’s broken I’ll throw it away, they get updated every couple of years, so it’s good to buy a new one. If you scan the map anyway, why not just load it onto your iPad? I would have thought it irresponsible to go without a map regardless of experience level. You never know what is going to be thrown at you. I fold up my map with the current section, and put it in a large A4 size zip-lock bag. Keeps the map dry, but does fray the fold lines. 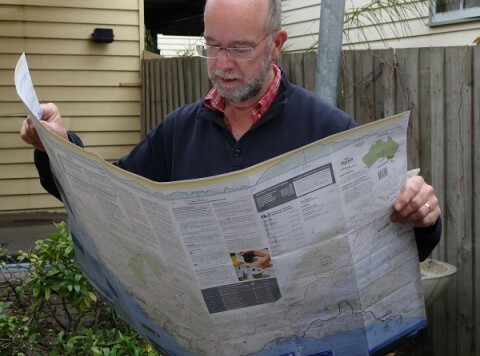 I’m doing the OT in March next year, and the map that Tas Parks sent is a ploymer – like Aus notes, but only thinner. In the UK Ordnance Survey maps http://www.ordnancesurvey.co.uk/ do a series which is ready laminated and flexible. They cost extra but its worth paying for if you hike in a particular area frequently. Scotch invisible tape – it has to be the “invisible” stuff – put along the fold lines can make maps last longer, adds minimally to the weight which could be recouped by trimming unwanted sections. THe Bibulman maps now have a waterproofed edition, I think these ready laminated maps are lighter & more flexible than DIY laminates. And of COURSE one needs maps particularly for multiday walks no matter how obvious the main trail – one may need an exit, or water, or a route to higher or clearer ground for phone/EPERB use, or merely a means of accurately describing the position of an injured walker. My dongle is loading slowly & I didn’t get the “how to do it” sections. Frank, can I suggest that you laminate section 1 with 5, 2 with 6 and so on? Sounds less logical but it means that you can look at adjacent sections more easily…….. I do laminate maps, but not always. An iron works fine, just iron with a protective layer like a towel. They survive well, even folded, for a week long trip. I write on them with a permanent marker, but that tends to rub off and smudge in your pocket. Zed – a laminated A4 print on 100gsm paper weighs in about 10g as I recall. My walking buddy prints extracts from the NSW topo map CD on waterproof paper – you can buy waterproof printer paper on the internet. Did not know it existed. Will check it out as it seems like a great option. Great idea and option….like it and will source it as well. Heaps better than putting talc/contact on it. Do you require a special printer to print on waterproof paper…..inkjet….cartridge…..laser? Just asking…. Do you require a special printer to print on waterproof paper…..inkjet….cartridge…..laser? Just asking….Thanks for the tip as well. Of course as I’m sure everyone is aware to make sure you leave enough outside of the walk for unplanned exit strategies and resections. It’s especially when off trail that your map will be your best friend. You have some excellent info on your site, it was well worth a look around. Instead of scanning, I’ve actually taken apart Chapman’s books and laminated the pages I need, so they’re pretty light. For other walks like offtrack I have photocopied and printed double sided the relevant sections of topo maps for the walks I’m doing and then laminated in 80gsm pockets. By photocopying I keep the scaling. Before laminating I mark the grid references if they’ve been cut off. I still take the original big map with me but it stays in my pack as it’s only really for emergencies. I’m very OTT with my maps! Even if the trail is well marked like the Overland.